There used to be the idea that you worked until retirement age, generally sixty five for men in Britain and until recently sixty for women, though this has recently changed. After that wonderful date you were not expected to do any economic activity, and the few that did were considered to be exceptions. Yes, you might help with the grandchildren, should you be blessed with any. You could potter in the garden. Note the word potter, as you were not expected to be vigorous. But this model is relatively recent, for people were active until far nearer old age and death than they were expected to be in our age. Nowadays there is a move to have a period between full time work and finishing entirely. We call this pretirement. Image above by Frank Beswick, showing how he spends some of his pretirement. So here I am, sixty four and said to be looking healthy for my age. I have an early teacher's pension, not much, but it is regular, and my state pension comes in June 2015, along with a small rise in my teacher's pension. Then the text message arrives from the supply teaching agency: am I looking for long term teaching work, reply if I am seeking it? I have not replied. Why? I have already told them that my resignation date is April. So why don't I grab a bit more money? Easy, it's about lifestyle. I am building a lifestyle that puts long term employed work behind me, a lifestyle that fits in with my feelings and self-awareness. Yes, I know that schools are becoming desperate for qualified Religious Education Teachers, but I do not feel up to taking the high pressure of the state school system any longer. Know thyself; and it is simply a matter of saying that I know when to stop. Pretirement means assessing where you are. You have to first consider your health and ability to take pressure. In my case my health is very good, but I feel less able to take high pressure situations of the kind that you find in school work. So that is stopping, but your self-awareness should show you what you can do, and there is so much that is possible. The key is to pace yourself. If you go with your natural pace you can work for ages. But if you over-pressure yourself, then you will feel it and be ill. Retreating to activities that you enjoy is very desirable, as it maintains your motivation, enabling you to continue for many a year. These kind of activities combine work and recreation, so you are working but replenishing yourself at the same time. Some can be voluntary activities. My father, who died in 2004, at 82, spent much of his retirement working for the Catholic Church as a Eucharistic minister, lay reader, charity worker and as an organizer for parish events. A blessed retirement in which he earned nothing to add to his pension, he was happy doing what he loved. 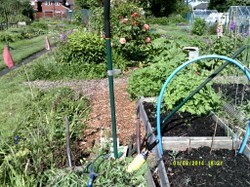 For me, the recreational activities are writing and gardening. I am on the allotment committee and we give help to inexperienced gardeners, particularly to the handicapped people who have taken up a half plot. I have some economically profitable interests, but they are activities that I find amenable, and I can do these for years to come, please God. There is a variety of activities to choose. Some people remain in economic work, going back to find an employer. Often this is on a daily, casual basis, or is part time. Some can handle a full time job in retirement age, but you must choose the job carefully. Amassing overtime may not be a good idea, as the extra pressure may not be beneficial for your health. Often workers find that they do less economic work as the years roll on. This can be due to the fact that they have no dependent children any longer and simply do not need the money or the stress of extra work beyond what need. Yet others start a new career entirely. A classic case of this was the famous mountain photographer Poucher, who retired at sixty as a chief perfumier at Yardley's, an elite cosmetics company, then spent thirty fit healthy years walking and photographing mountains. He in effect had two full careers. He was very physically fit. There are those who develop an interest and turn it into a full time occupation. I saw a case on television two or three years ago of a gentleman who was running a business producing pumpkins and squashes in his nineties. True, he had young people to dig for him, but he was running this operation till he died at ninety seven. There are old men working allotments until their eighties. They have tilled the ground well over the years and now it requires no great effort. Men like this are physically fit and healthy, as the outdoor life is a great power for well being. You might do charity or church work. Some spend their time caring for grandchildren. I know that my wife is looking forward to the time when she can do this. I will be able to take the grandchildren to the allotment when they reach an age where they can enjoy it. They will love the pond with the tadpoles and the frogs. As I approach the date of state pension I find that I am trying to balance out my life. I am not as driven as I once was, and have no ambitions. In fact I told the examination board to stop offering me the chance to go for promotion and to give the opportunities to younger people. Years ago I drove for it.Not now. I am seeking a balance in my life between work and relationships. I have no debts and no dependent children, so why work under pressure any longer. Enjoy living. Pretirement should be a reflective, spiritual time when money making takes a lower place than living a genuine fulfilled and human life in which you enjoy your relationships, which in our society are often sacrificed for work. Part of my morning routine is checking on my ninety four year old mother-in-law, when my wife is at work. She also only works part time, having downshifted from a full time middle management position in a primary school that soaked up her time in the evenings and left her exhausted. I ensure that any jobs that my mother-in-law needs doing are done and I tend the front garden for her. Downshifting from high pressure jobs is a life-saver. No one should hang onto a senior position for too long. Know when to let go. Your retirement should be a time which you approach in a positive spirit. It should be seen as an opportunity for growth and new direction in life, for a state in which you are in control and a boss is relegated to distant, fading memory. If we approach with positive attitudes we will remain healthy and active for many years; but a negative approach will lead to misery and earlier failing of health. Thanks. An agency contacted me today for a lecturing job. I turned it down. I have enough money and plenty of productive activity to do. Keeping you up to date. My strategy is to write, garden and work for the examination boards. My political party, local branch, came to me and said that they realize that I will not be standing for council elections again, but can I act as a kind of elder statesman to the young candidates that they want to bring forward. I am also been elected vice chair of my allotment association and an official of the area society. This shows how giving up full time work can be the door to a more positive way of life. In a few weeks time I will add my state pension to my occupational pension, which I took early. I will do some paid work afterwards, but I will mainly write, garden and work for the allotment society, with maybe a bit of work for my political party. I won't need much money. My husband is in this pretirement stage. He recently moved from working full time to just a few days a week. At first he was concerned about finances and what he would do with his time. However, we learned very quickly to adapt to a much lower income and are spending much more valuable and enjoyable time together going for walks and doing gardening. It has become a really pleasurable time of life. Some significant pretirement events this week. I decided to finish classroom work for good, a few weeks ahead of the planned date. But the great announcement can be made now. I spoke of helping with grandchildren in a general sense, but was not ready to state that my first grandchild is on the way, due in late August. I knew when I wrote the article, but my son did not want to declare until the mother had had her three month scan. That's why I could not reply to you, Ologsinquito, when you said how blessed I was with grandchildren. I would normally have replied. Good advice Frank, thank you. In the UK employers are obliged to provide a pension scheme, and basic medical treatment is free, though old age care is not. What you say about pretirement is of great worth, as it shows that it is affected by conditions that vary between countries. The reason that I see self-reliance as an integral part of pretirement is that it is taking control of one's life at a time when employment opportunities are shrinking. No school will give me a long temr job now that I am sixty four, and I do not want one, but I have my eye open for small opportunities that wll make me money. With inflation and cost of living on the rise, one needs to be wise and practical. I need to plan my retirement income here and now, I really do not have a choice. My mother was fortunate because she had pension, now with dwindling opportunities in government sector, people cannot rely on old age pension schemes. Also, private companies do not offer retirement benefits. Medical expenses are the most important and a big chunk of your income will go in paying those bills. If you are healthy, you can definitely make it work. Pre-retirement as put by the author gives us a thought to contemplate and be prepared for the retirement when it strikes at us at difficult times - we might not be ready yet and with the knowledge that we are no longer employable. The key, Telesto, is to think lifestyle. What is the lifestyle that you want? As a writer you will be a cerebral person at home in her own thoughts and probably more interested in ideas than possessions, though you need money to live. Try to design a life around who you are. I find that who I am makes be best in quiet situations, working alone as a writer/examiner or with individuals, so I have tried to design my life accordingly.